A member of Year 9 has told me that she’s fascinated by astronomy, as am I. So, I’m going to post a few interesting links from time to time here which I happen to have seen and enjoyed myself. I liked this video about the Sun in particular and this link to NASA images is changed every day. Finally, there’s links in the sidebar to the space telescope Hubblewatch’s weekly podcasts, so you can listen to the most up-to-date information. The Kepler mission to search for habitable planets is well worth a listen. 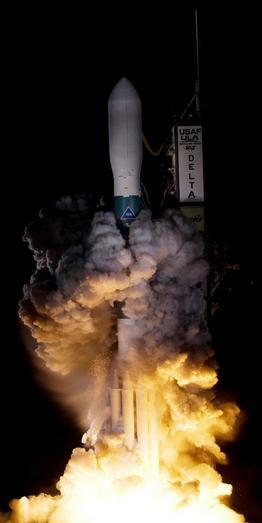 The image is of the Delta rocket sending Kepler into space, where it will gaze at a patch of sky for over three years, looking for the dimming of starlight as a planet passes between it and a star, perhaps like our Sun. Enjoy. Here’s a block of copper. Doesn’t look like it, but it’s the best I could do. For now, let’s pretend that it has a mass of 0.1kg and is at a temperature of 1000C (which we ensure by dunking it for a while in some boiling water.) It isn’t but we’ll get to that later. In the meantime, we get some water, say 200g or 0.2kg in a polystyrene beaker (so we don’t have to worry about it receiving any heat) and take the temperature. Let’s say it’s room temperature, 20oC which we can measure with a thermometer on the bench. We drop the copper in the water and stir it gently. Looks easy, but it isn’t in practice. Probably the best way is to tie some cotton to the block and pretend it’s a teabag when we transfer it. The copper gives its heat to the water. After a short while, we take the temperature of the water again. We know that the SHC of water = 4200J/kgoC – look it up in a book. The actual value is close to 400 J/kgoC. Our measurement is too low. Why is this? Here’s a question. Is the copper at exactly 100oC when it goes into the water? If not, what might its actual temperature be? Suppose its actual temperature is close to 90oC, because it loses some heat by convection and radiation on the way over. So the temperature of the copper falls by only 67oC, giving us a value of 376 J/kgoC, which is a little bit better. Here’s the trick. Heat is always lost on transfer so measured SHC’s are always too low. Earthquakes aren’t as rare as you might expect. Every year there are over 300,000 of them worldwide. Fortunately, most are unnoticeable without special detectors, but if there’s a huge or ‘great’ earthquake, there can be massive loss of life, like this one caused in Sichuan, China last year with almost ninety thousand dead and five million left homeless. The Earth’s outermost surface is broken into 12 rigid ‘continental’ plates which are 60-200 km thick and float on top of a more fluid zone, much in the way that icebergs float on top of the ocean. When the earth’s plates slip over one another on land, the result is an earthquake. If it’s under water, it’s a tsunami. Question: What happens when continental plates shift, or one slides under another? Answer. An awful lot of energy gets shifted very rapidly. Place your hands together with your thumbs up. By pushing your hands together you create pressure between your hands. As you try to slide your hands apart, you create friction which stops you from sliding your hands easily. Stress builds up in your hands and arm and eventually the hands slip apart quickly. Thanks to a willing volunteer from year 10. What if two plates slipped under the sea? A huge body of water would drop suddenly and a tsunami would be on the move, a bit like a ruck in a carpet, travelling very fast. As the depth of water decreased, the wave would get bigger and bigger, finally releasing its energy on the shore. Also, some energy would travel explosively down towards the centre of the earth, some reflecting from layers of different density, or refracting through them and eventually making its way back to the surface as a longitudinal disturbance. These disturbances are caused by the plates slipping and deforming elastically, then returning more or less to their original positions. The released energy travels through the Earth in the form of waves. These waves are separated into three classes: primary, secondary and surface waves. Primary, or P waves, are the first waves felt because they are the fastest. They move in a compressional, “push-pull” manner similar to a spring that temporarily changes the volume of the material they’re moving through. These waves can travel through liquid, solid and gaseous matter. Secondary, or S waves, are felt next. These waves move in an oscillatory, “up and down” manner similar to shaking a rope that temporarily changes the shape of the material they’re travelling through. Because liquids respond to changes in volume but not shape, they can’t transmit S waves. Finally the surface waves are felt. These waves are more complex. Rayleigh waves move up and down like ocean swells along the Earth’s surface while Love waves waggle side to side or horizontally. Surface waves, as you might expect, are most damaging to man-made structures. S (Secondary) waves are transverse and go a little bit slower (4km/s) Have a look here which shows the movement of an earthquake in the Earth’s core. A seismogram is a record of earthquake movement, recorded on a seismograph. Notice that the P wave gets there first, followed by the S wave. This detector was 8400km from the epicentre, or starting point, of the earthquake. Check out this little animation, which shows you how a seismogram measures the shaking of the ground as an earthquake passes.